Companies, tiny to titan, flourish here – from the neighborhood mom & pop to the Fortune 500s known around the world. We embrace entrepreneurs, cultivate innovation and let imagination run free. This is no flyover country – prepare to land. A region that excels at exceeding expectations. Characterized by steady growth, we’ve expanded by 7 percent between 2010 and 2016, growing 2 percent more than the nation 1. We make more – and pay less. Our low cost of living and competitive wages create a spending power of $50,481 – 14.9% above nation’s ($43,925) 3. Our steady economic growth is the envy of the nation. 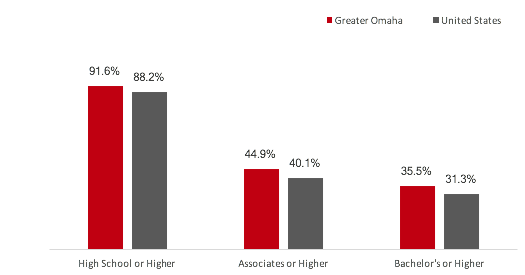 Greater Omaha produces more than $47 billion in goods and services each year 6. Our entrepreneurs are more successful – earning an income that’s twice as high as the national average 7. Companies, tiny to titan, flourish here. From our strong business climate, to our first-class resources, we’re proud to cultivate an environment ideally suited for companies wishing to start, grow or expand operations. We work hard to keep the business climate friendly and taxes moderate. Our cost of doing business is 6.1 percent below the national average 8. Our population not only possesses the education and qualities employers are looking for, but encompasses the Midwest work ethic simply part of the fabric of our region. More than 91 percent of adults 18 years and older are high school graduates, compared to the national average of 88 percent. 28 direct flights including San Francisco, Los Angeles, New York City and Washington, D.C.
We’re Only as Boring as You Are. We soak up a dynamic slate of entertainment that showcase the sights, sounds, creativity – and tastes – that typify our community. Affordable housing, great schools and universities, innovative hospitals and medical centers encompass all of the indispensable elements you need to flourish. See We Don’t Coast to learn more! This is no flyover city. Prepare to land. Enthusiastic, full living with a serious cool factor. We chose to be in the center – see why.